Palak paneer (spinach with cottage cheese) is a rustic dish and an old favorite of Punjab (North India). This hearty dish is delish and abundant in flavor and nutrients. Leafy greens and paneer both are used extensively in North Indian kitchens and there are many recipes calling for these ingredients. The five rivers flowing through Punjab make the land fertile, rich and suitable for earthy vegetables such as spinach (palak), fenugreek (methi), rapini (sarson). Being a rich farmland, dairy forms an essential part of everyday meal be it in the form of buttermilk, ghee or paneer. India being primarily vegetarian, its cuisine has developed interesting meat substitutes and paneer perfectly fits the bill. Having a mellow taste and a spongy texture paneer partners well with vegetables, pulses and grains. Lightly fried cubes of paneer (Indian cottage cheese) and pureed spinach are simmered in an onion tomato gravy till flavors blend in. Palak paneer goes well with roti, paratha, naan and jeera rice with a side of raw onion rings and crisp green chilies. A vegan variation would be to substitute tofu for paneer. Use firm tofu for this purpose which can withstand the frying and simmering process. 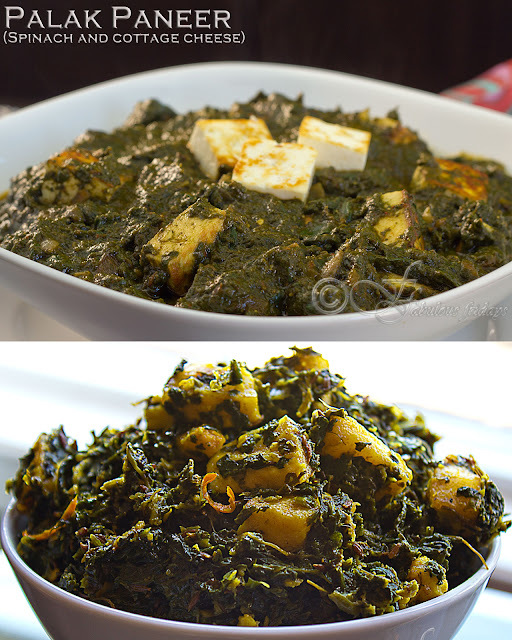 I make palak paneer in two different ways. One the more traditional recipe and the other a stir fried version which is much healthier and less calorie dense. Its not as creamy as the other version but taste awesome for those quick meals. So call it the shortcut method. Make sure to try them both. Here are the two versions. Wash and drain spinach. I usually boil it in a pressure cooker. 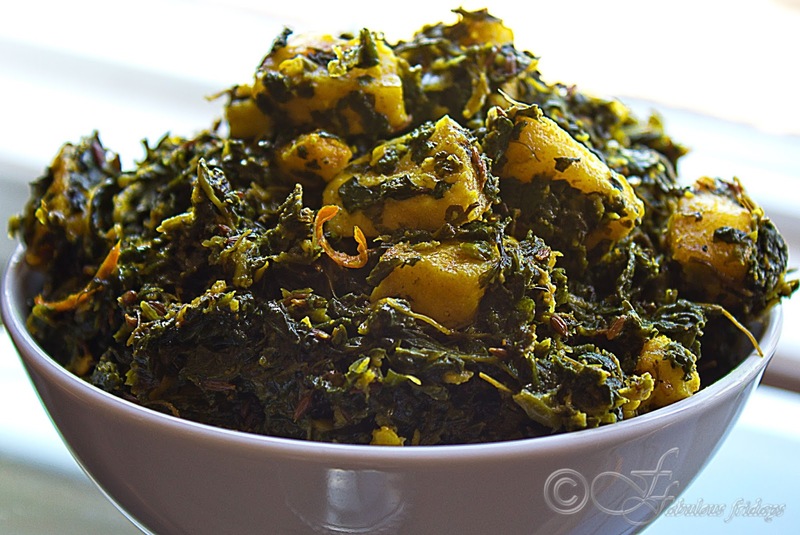 Place the spinach leaves in a pressure cooker along with chopped green chilies, grated ginger and salt. Pressure cook for 3-5 minutes. Remove from heat, cool. Puree boiled spinach coarsely, keep aside. Heat vegetable oil in a pan on medium and fry the cubed paneer till lightly golden on all sides. Keep aside. Heat olive oil in a separate pan and add cumin seeds. Let roast for a few seconds before adding onion. Saute on medium high for a minute. Add ginger and garlic and saute till everything turns golden. Add the tomato puree and cook on high for a minute. Add pureed spinach and fried paneer along with all the dry spices. Bring to boil. At this point you might want to cook this concoction covered as there will be a lot of splattering. Simmer and cook for 5-7 minutes till all the flavors blend in. Taste and add more salt if needed. Serve hot topped with a dollop of butter with roti. Wash, drain and chop spinach fine. Keep aside. Heat oil in a pan, add cumin seeds and let them roast for a few seconds. Add grated ginger and garlic and saute for 4-5 seconds. 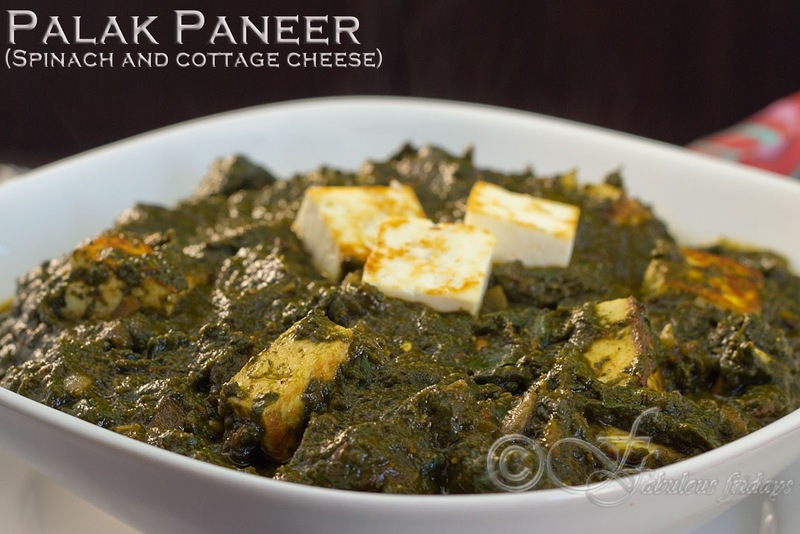 Add the chopped spinach and paneer and the rest of the ingredients. Mix well and cover. Simmer and cook for 7-10 minutes, stirring occasionally till done.